UPVOTE! IF YOU ENJOYED VOLTRON CHROMIUM! Please pardon our dust! We are under construction. Operation: Protean Chromium, Elder Dragon. The game plan is simple. Ramp with mana rocks, to cast Chromium, the Mutable, as early as possible. The focus before casting our commander, is to play mana rocks and tutor for Zur the Enchanter. When Zur the Enchanter attacks, grab either Necropotence, Phyrexian Arena, Rhystic Study, or Mystic Remora from our library, to give us a way to draw. Abuse some draw, so we can dump all of our auras spells into the graveyard with Chromium, the Mutable discard ability. Note that this does not work with Necropotence, since all cards discarded are exiled instead. Another way to get our auras in our graveyard, is to mill ourselves by using either Traumatize or Tunnel Vision. With Tunnel Vision we can name Open the Vaults for some fun tech. Anyway, now that we have a sizable amount of auras in the graveyard. It’s time to cast either Open the Vaults, Replenish or Retether, to put all the auras into play, on Chromium, the Mutable. Enter the Voltron and swing away at your opponent, to kill them with commander damage. Of course, there are alternate ways to pilot the deck, but that’s the overall goal. I hope you enjoy! Some of the commander decks I face regularly would be: Scion of the Ur-Dragon, The Gitrog Monster, Norin the Wary, Atraxa, Praetors' Voice, Jhoira of the Ghitu, Talrand, Sky Summoner, Vial Smasher the Fierce, Hapatra, Vizier of Poisons, Niv-Mizzet, the Firemind, Ayli, Eternal Pilgrim, Rashmi, Eternities Crafter, Maelstrom Wanderer, Noyan Dar, Roil Shaper, Sliver Overlord, Sharuum the Hegemon, Uril, the Miststalker, Geist of Saint Traft, Ramos, Dragon Engine, Thada Adel, Acquisitor, Taigam, Ojutai Master, Bruse Tarl, Boorish Herder + Kraum, Ludevic's Opus, Akiri, Line-Slinger + Silas Renn, Seeker Adept, Sakashima the Impostor, Mina and Denn, Wildborn, Shu Yun, the Silent Tempest, Thrasios, Triton Hero, Grand Warlord Radha, Savra, Queen of the Golgari, Athreos, God of Passage, Ghalta, Primal Hunger, Mikaeus, the Unhallowed and Tatyova, Benthic Druid. 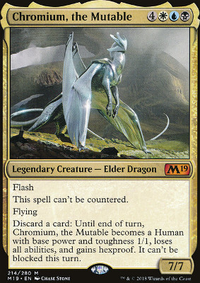 Chromium, the Mutable: Is instant speed, can't be countered and evasive with flying. Not to mention, he can protect himself by discarding a card and becoming a 1/1 unblockable human with hexproof. We can use the discard ability to our advantage and reanimate the discarded cards from the graveyard. Auramancer's Guise: Receive a +2/+2 buff for each Aura attached and gain vigilance. Battle Mastery: Gain double strike. Lay on the commander damage, smack down. Blessing of the Nephilim: Gives Chromium +3/+3 buff for having in his identity. Celestial Mantle: +3/+3 buff and double our life total, whenever combat damage is dealt. Daybreak Coronet: Need an additional Aura attached to Chromium, in order to attach. But gives +3/+3, first strike, vigilance and lifelink. Edge of the Divinity: Gives Chomium, +3/+3 for having and in his color identity. Eidolon of Countless Battles: Cast for it's bestow cost and attach to Chromium to give a +1/+1 buff for each creature we control and each Aura we control. Eldrazi Conscription: Holy beat stick, Batman! +10/+10, Trample and annihilator 2. Even better when we can cheat it in with Sovereigns of Lost Alara or by discarding it and reanimate it with Replenish or Retether. Empyrial Armor: Get a +X/+X buff, based on the amount of cards in our hand. Ethereal Armor: Get +1/+1 buff for each enchantment we control and get first strike. Felidar Umbra: Lifelink and totem armor for protection. Phyresis: Grants infect. Making it very easy to take out an opponent. Sage's Reverie: ETB and draw a card for each Aura we control. Also, gives a +1/+1 buff for each Aura we control. Combos well with Flickerform. Steel of the Godhead: Chromium gets +2/+2, lifelink and is unblockable for having and in his color identity. Chromatic Lantern: Adds one of any color to our mana pool and gives our lands the same ability. Chrome Mox: Add one mana of any color that was within the exiled card's color. Coldsteel Heart: Choose a color and it adds one mana of the chosen color. Dark Ritual: Instant speed, add . Great for casting Chromium on an opponent's end step, when they least expect it. Maybe even use it for a turn 1 Necropotence. Darksteel Ingot: Indestructible and adds one mana of any color. Fellwar Stone: Add one mana of any color that an opponent's land could produce. Gilded Lotus: Add three mana of any one color. Grand Arbiter Augustin IV: Reduces the summoning cost of Chromium by for having both and in his color identity. Also, makes our opponent’s spells cost more to cast. Heartless Summoning: Reduces Chromium’s summoning cost by , with the side effect of -1/-1. Call your doctor if this lasts for more than four hours. Be cautious when using, this will kill, human Chromium. Lotus Petal: Sacrifice to add one mana of any color. Mana Crypt: Add . Remember, tails never fails. Mox Diamond: Add one mana of any color. Omniscience: Discard this card then cheat it into play with Replenish and cast any card in our hand without paying for the mana cost. Kor Spiritdancer: I don't typically buff her with Auras, but I do like that we can draw a card anytime we cast an Aura spell. Mystic Remora: I tend to keep this in play for a few turns, to get some good draw in, before it becomes too expensive to upkeep. Necropotence: One of the MVP's in the deck. It's very important to tutor for this early on or have Zur the Enchanter go grab this after declaring an attack. We tend to empty or hand, very quickly, so it's important we always keep it full. Phyrexian Arena: Draw a card on our upkeep at the cost of losing 1 life. Not a bad trade off. Rhystic Study: My buddy's favorite saying, "Are you going to pay the extra?" Sensei's Divining Top: Dig through the top three of our library. Can be used to draw a card in a pinch. Especially, after casting Tunnel Vision and being able to draw, then cast that Open the Vaults on the same turn. Sram, Senior Edificer: Draw a card anytime we cast an Aura or Equipment spell. Cyclonic Rift: The only removal we run. Override to bounce all nonland permanents we don't control. Demonic Tutor: Best when tutoring for Zur the Enchanter, Necropotence, or Tunnel Vision early on. Whatever our situation may be, it grabs anything we would like at the moment. Enlightened Tutor: Instant speed tutor for an enchantment and for me, it's Necropotence or possibly Solitary Confinement. Grim Tutor: Situational tutor. Grab anything we find necessary at the time. Imperial Seal: Situational tutor. Grab anything we find necessary at the time. Mystical Tutor: Instant speed that can be used to tutor for Replenish, Retether, Open the Vaults, Traumatize, or Tunnel Vision. Sovereigns of Lost Alara: Have Chromium attack alone and get a temporary +1/+1 buff and cheat in from our library Eldrazi Conscription to put the frosting on the cake. Vampiric Tutor: Situational tutor at instant speed. Grab anything we find necessary at the time. Zur the Enchanter: Another MVP in the deck. When he attacks, he can cheat in from our library, Necropotence or Solitary Confinement. Afterwards, put into play Auras such as, Steel of the Godhead, Battle Mastery, Phyresis or Shielded by Faith. Helm of the Gods: Get a large buff of +1/+1 for each enchantment we control. Traumatize: Not in here to mill our opponent, but to mill ourself... Sounds so crazy, it just might work! Follow up with either Open the Vaults, Replenish or Retether to cheat in a mass amount of Auras from the graveyard into play. Tunnel Vision: Yet again, not in here to mill our opponent, but to target ourself. I like to name Open the Vaults, dump tons of Artifacts and Enchantments into the graveyard. Then once we draw Open the Vaults off the top, we can cast it to put into play all of those Artifacts and Enchantments that hit our graveyard. Elixir of Immortality: Shuffles our graveyard into our library after using such spells as Traumatize or Tunnel Vision. Nomad Mythmaker: Put into play from our graveyard, an expensive Aura, like Eldrazi Conscription or whatever flavor Aura we desire. Open the Vaults: Reanimates everyone's lost Artifacts and Enchantments. Replenish: Reanimates our Enchantments that are in the graveyard. Retether: Reanimates our Auras that we have discarded into the graveyard to enchant Chromium into Ultimate Voltron. Snapcaster Mage: We can flashback a Replenish or even a tutor card to get us a piece we currently need. Yawgmoth's Will: Reanimate any important lost pieces that are in our graveyard. Conqueror's Flail: Equip to Chromium, to give us protection from our opponents trying to foil our plans in attempt to cast big bombs on our turn. Curator's Ward: Protect a valuable permanent, by granting it hexproof. Flickerform: Blink Chromium and all Auras attached to him from play, until end of turn. Do this to protect us from harms way. Also, pairs extremely well with Sage's Reverie. Gift of Immortality: Destroy Chromium? Sure! He'll only come back to haunt you. Grand Abolisher: Sounds like we have free roam on our turn to do whatever we please and nothing is going to stop us. Shielded by Faith: Why must you keep trying to destroy me?! You are very persistent to attempt to break the unbreakable. Solitary Confinement: Shroud and protection from the overwhelming aggro decks just trying to beat face. Exquisite Blood + Sanguine Bond : Deal damage with Chromium, while this pair is in play, to kill all opponents.